Company Finds iPhone Users Most "Chatty" and Android Users Most "Popular"
NEW YORK, NY--(Marketwire - September 30, 2010) - Intermedia, the world's largest Microsoft Exchange hosting provider, reports that 50 percent of the employees at the small and medium-sized businesses that the company supports use smartphones to access their email. This is in contrast to a recent survey Intermedia conducted with Harris Interactive, which found that only 38 percent of small and medium-sized business workers use smartphones. Cloud-based email users are more likely to access email from smartphones because of specifically-designed email syncing capabilities that mirror the desktop email experience. 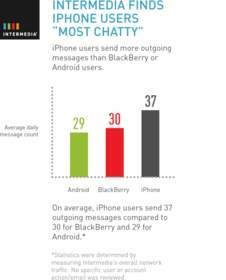 iPhone users are the "most chatty," sending more outgoing messages on average per day than BlackBerry or Android users. 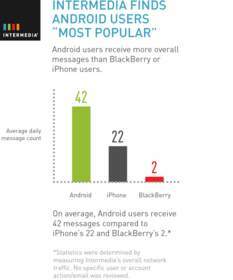 Android users are the "most popular," receiving more overall messages on average per day than BlackBerry or iPhone users. Note: Statistics were determined by measuring Intermedia's overall network traffic. No specific user or account action/email was reviewed. For info-graphics representing the data, see Intermedia's Exchange hosting blog. "Staying in sync with the office regardless of time or day has become imperative in most industries," says Jonathan McCormick, chief operating officer, Intermedia. "But securely supporting the different smartphone options can drain an in-house IT manager's resources. With our hosted Exchange service, employees can choose the smartphone option that makes the most sense for their business and personal needs -- from BlackBerry, to Droid to iPhone -- without creating complexity for the IT department. " 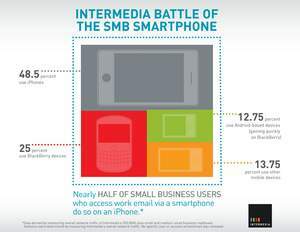 Intermedia supports business email and collaboration on a full range of smartphones, including devices such as BlackBerrys, Google's Nexus One, Motorola Droid, Palm Treo, Motorola Q, T-Mobile Dash, iPhone, the Samsung Blackjack and more. Intermedia is the premier provider of communications services, including hosted Microsoft Exchange, to small and mid-sized businesses. For an affordable monthly fee, customers get business email, VoIP telephony, smartphones, instant messaging, fax and other communications delivered as a service with 24x7 support. Intermedia also empowers thousands of smaller VARs and MSPs -- as well as select Fortune 500 companies -- to sell communications services under their own brand. Founded in 1995, Intermedia was the first company to offer cloud-based business-class email and now has over 250,000 premium hosted Exchange mailboxes under management -- more than any other provider. For more information, visit www.intermedia.net. Harris Interactive is one of the world's leading custom market research firms, leveraging research, technology, and business acumen to transform relevant insight into actionable foresight. Known widely for the Harris Poll and for pioneering innovative research methodologies, Harris offers expertise in a wide range of industries including healthcare, technology, public affairs, energy, telecommunications, financial services, insurance, media, retail, restaurant, and consumer package goods. Serving clients in over 215 countries and territories through our North American, European, and Asian offices and a network of independent market research firms, Harris specializes in delivering research solutions that help us -- and our clients -- stay ahead of what's next. For more information, please visit www.harrisinteractive.com. The Harris Interactive survey was conducted online within the United States on behalf of Intermedia from June 3-7, 2010 among 2,071 adults ages 18 and older. This online survey is not based on a probability sample and therefore no estimate of theoretical sampling error can be calculated. For complete survey methodology, including weighting variables, please contact Julian McBride at 646-202-9775, julian.mcbride@horngroup.com. Respondents are defined as full time/part time employed adults who work for a company with less than 250 employees and receive work-related emails.